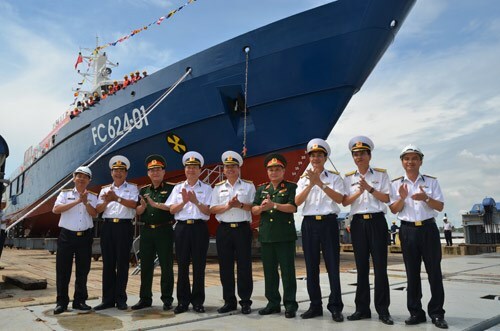 A factory of the defense ministry in Ho Chi Minh City on Tuesday launched the most modern patrol and rescue boat ever built by the country. 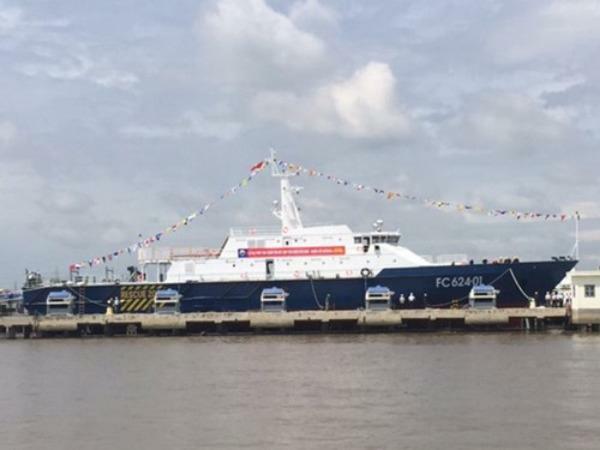 The boat of 700 metric tons, 63 meters long and 12 meters wide is built anew for the Vietnamese Navy, using German engines, communication devices that meet international standards, and having a helicopter pad. It uses design of a British Russian joint venture company which allows operation in tough waters with wind power of 118-133 kilometers per hour. It can sail at up to 25 nautical miles per hour and for 15 days straight at sea. Vietnam Navy’s officers attend the launch of the new patrol boat in Ho Chi Minh City on June 16, 2015. Its job is to chase away illegal boats in Vietnamese waters and to provide necessary support for the country’s boats at sea. There’s enough space for it to rescue 120 people at one time and devices to provide first aid support, including a surgery room and equipment for simple operation, a respirator, an ultrasound scanner and ECG machine.